I walk around Israel like a kid in a candy store. There are Jewish messages embedded everywhere. Sometimes, my husband sees them first and he points out what he knows will delight me. Here are some favorite scenes from my everyday life in Israel over the past few weeks. "Welcome Rav Elan and Rivkah. Shabbat Shalom." a mother and daughter passed the time reciting Tehillim (Psalms). that they are American made. I always find this deeply ironic. "In every Jew, there is Moshiach." Tehillim 102:14-15 "Rise up. Comfort Zion... Because her servants take pleasure in her stones and love her dust." Especially apt because the house upon which these words appear was built in the middle of an undeveloped area. This is the house on which the verses from Tehillim are displayed near the front entrance. In context, they make a lot more sense. My favorite! This one reminds customers in this produce store not to forget to say "In honor of the Holy Sabbath" when selecting fruits and vegetables that will be served on Shabbat. POSTSCRIPT: After this post was published, comments led to this - one more picture, taken on an Egged bus by fellow blogger SaraK, who shares my proclivity for photographing "only in Israel" images. "To the soldiers of Israel: Go and return home in peace! We love you. From the Nation of Israel." Did you see the one I posted recently on FB? I am originally from Prague Czech Rep. and have been living in Brooklyn , NY for the past 15 yrs. My husband is Israeli. I came across your blog by accident (Or by divine intervention :) . We are in a process of making aliyah w/ our children. I am super nervous. I will keep checking your site. Thank you for all the helpful posts! SaraK - I went back to find your photo on Facebook. Exactly something I would have photographed! I wish there was a way I could link to it here. 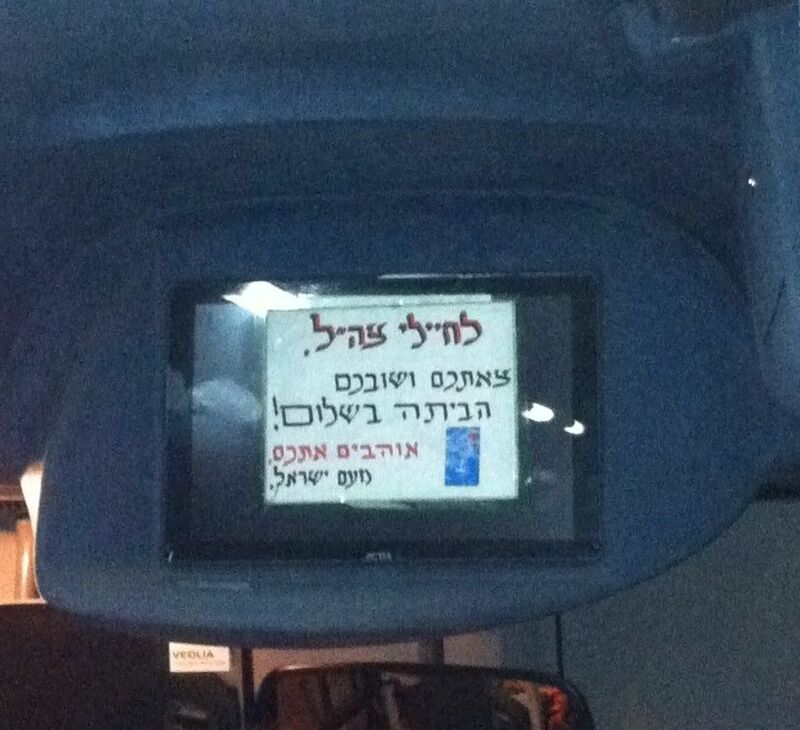 For everyone else, it was a handwritten sign inside a bus that reads, "To Israel's soldiers: Go and return home in peace! We love you. From The Nation of Israel." You say that the Arab and chareidi women are signs that Israel is an apartheid country...don't you mean the opposite? By being together in the same place with the same conditions it is proof that Israel is a democratic, non-racist state!!! Anonymous - Mine was a tongue-in-cheek comment. But now I'll go back and add clarification. Rivkah, thanks for the great posts. Loved them!